Castletown House is a splendid Palladian-style mansion set in Celbridge, County Kildare on extensive 18th-century parklands. Stop by and visit the unique Print Room, Long Gallery and magnificent Portland stone staircase in this incredible house. 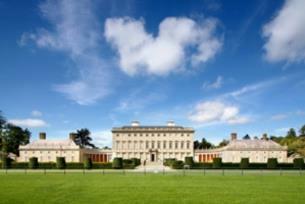 Located in County Kildare, Castletown House and Gardens is Ireland's largest and earliest Palladian-style estate. It was built between 1722 and 1729 for William Connolly, speaker of the Irish House of Commons and the wealthiest commoner in Ireland. The façade was almost certainly designed by the Italian architect Alessandro Galilei, while the Irish architect Sir Edward Lovett Pearce added the wings. Visit Castletown House to explore the beautiful 18th-century parklands, with river walks, a temple and the remains of a bathing house. In the 19th century, restoration efforts were concentrated on the immediate surroundings of the house, with the creation of a formal garden behind the house, and the planting of the yew trees in front of the house. The break-up of the estate in the 1960s however meant that the immense walled gardens, formerly situated to the north-west of the house have been built upon. These kitchen gardens were by the early 20th century the most profitable aspect of the estate, and a great source of local employment. Today only the farmyard beyond the west wing remains. In 1994, the house was transferred to state ownership and is now managed by the Office of Public Works. The transfer has paved the way for a major programme of restoration and conservation work of the house and demesne lands. Stroll around the gardens of Castletown House and explore the history of the house itself—the perfect way to while away a day out in County Kildare. Do check the website for details of events taking place during the year.